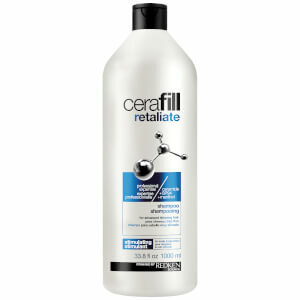 Redken Cerafill Retaliate Conditioner for Advanced Thinning Hair helps you to make thin and thinning hair look visibly fuller. Boasting a menthol formula, the conditioner gives the scalp a cooling and tingling sensation that infuses weightless body, volume and shine to hair. The conditioner exudes an invigorating ginger mint fragrance and features Cerafill System Technology that strengthens the hair fiber to prevent breakage, as well as nourishing hair and promoting a healthy scalp. After shampooing, apply and distribute from scalp through ends. Leave on 1-3 minutes. Rinse.